So... I got my roster for next month. It was originally London Heathrow, Athens, London Heathrow (despite the fact that I put down Avoid Europe), Shanghai, Entebbe (which is in Uganda BTW, and I also put down Avoid Africa), and a Seoul flight. I changed my first LHR for a Rome, which I'm delighted with, and to be honest, I have no idea why anyone would want to change a Rome flight for what is one of the least desired flights in our network. Poor love probably needs to go home. Okay guys, I'm back in Perth, and yeah, Dullsville hasn't changed a great deal. Seen mum already on Friday, and she looks pretty crook. They shaved all her hair off when they had to operate, she can move her feet, she grinds her teeth a lot, and she's eating pureed curry. One of her Thai friends painted her fingernails, and is coming in again to paint her toenails, and they look beter than mine! I'm also keen to catch up while in town, I'm still on my old aussie number (even though I lost my mobile in Sri Lanka - the numbers are the same but the phone is much nicer - a Nokia 7370. I'd had my eye on it for a while and the last phone I had Optus insurance paid for anyway.) So if you wanna catch up, please SMS me very soon - time is running out! 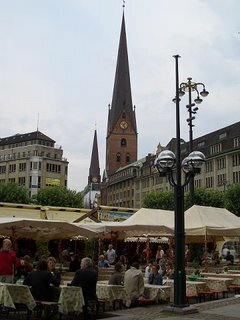 The Rathausmarkt right outside the city hall, where they were holding the Frankfurt Food and Wine Festival. Yummy stuff. 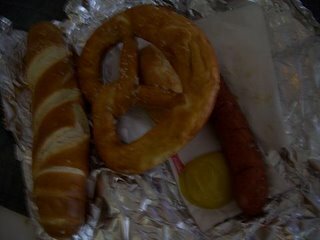 My Pretzel bread and Bratwurst with a dollop of mustard. The Bratwurst was a little strong, but otherwise it was very very good. 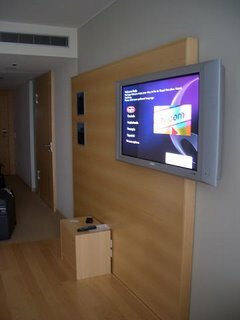 My big "Piss Off" TV. It was a bit strange trying to watch NCIS and Greys Anatomy in German, and was kinda annoyed at myself since the only English Channels were MTV and CNN. You don't have to think too hard to know which one I saw the most. The street where we were staying. 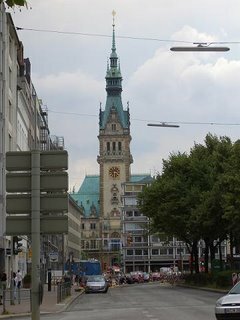 Nice shot of the city hall ("Rathaus"). 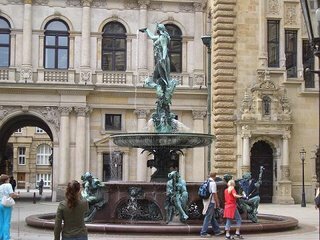 Some random fountain called the Hygieia-Brunnen inside the city hall along the Mönckebergstraße. 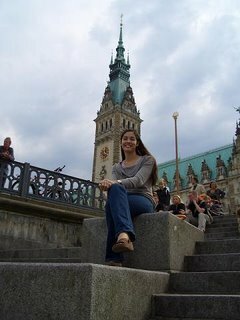 Pretty average picture of me on the steps that lead out to the Elbe river, with a view of the Mönckebergstraße at the rear. 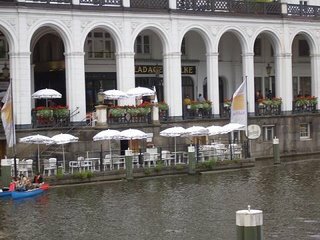 Proper riverside dining along the artificial river Binnenalster. 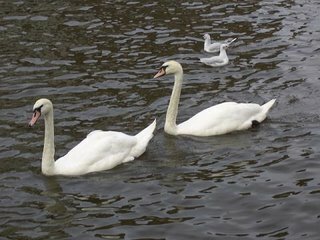 Couple of swans on the Binnenalster. Just got off an Airbus 330-300 from Hamburg. It was gruelling, I'm tired, and I just spent 6 hours in an aircraft with an (alleged) ADD kid who screamed for 5 of those hours. Will elaborate tomorrow. Need sleeeeeeep. Okay guys, back on Dubai soil. Had a weird time in Colombo. 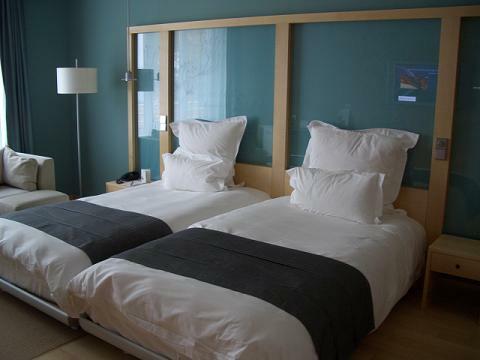 I was told that the hotel was gonna be real grotty, and took a bedsheet and a pillow case as well. Turns out that the whole place is pretty nice, very opulent and very much a tropical paridise. Only downside was they put me in a smoking room (I requested the opposite) and I was stuck in a dusty room with bad asthma. Not only that, the day before we were due to land in Colombo a car bomb went off, so we had a curfew in place. The hotel didn't haven any tours going on, and it wasnt safe for us to go out. So what happens? Leave my laptop battery charger in the hotel, and leave my mobile phone in the crew bus on the way to the airport in Colombo. Talk about the Thai blonde. 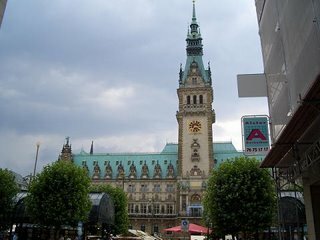 Now I'm off to Hamburg. 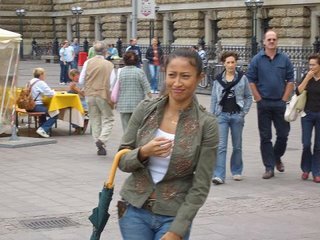 For the rest of the month I'm Miss Germany, flying to Hamburg, Dusseldorf and Frankfurt. Hopefully I won't arrive back in Perth chubby from all the Bratwurst I'll be eating. Well, nothing too great to write home about. Walked along Orchard Rd where the big shopping district is, and it was very much what I imagine Bangkok to be. Very busy, lotsa cheap electronics and souveniers. There's this department store purely dedicated to Duty Free goods, 5 floors of non-stop salivating. They also sell these outfits known at Batiks, which if you get you can look exactly like a Singapore Airines flight attendant. I also got a set of pearl earrings and a necklace for work. (We can't wear silver at all, and gold jewellry is not only expensive but it's hard to know if the piece you have on is accepted by one Purser whilst being too outrageous by another.) As it turns out by the time I arrived back at the hotel I got a call from my bank saying that they had charged me over 10 times the price. WTF!!! I was very angry, and by the time I got back to the jeweller I was very upset. I managed to get the void receipt off them, but only after they fished it out of the bin. How's that for good account management! Even when I was working at Metro if we accidently charged a table or room we couldn't cancel it, we had to credit it back, as well as show the patron what had happened. HSBC said that it would take 2 weeks for the amount to clear, so now I can't use it (the oversight tipped over my limit) so yeah I'm very pissed off. My shopping experience otherwise was very good. I had intended to go to the Jurong Bird Park and the National Orchid garden, but I walked outside and it started to bucket down, so gave it a miss. Saw a lot of Louis Vuitton, Burberry, Chanel and Fendi, as well as a fair few Starbucks. Lotsa cute food halls with that smell of SE Asian food only SE Australiasians would recognise. I started to get a headache midway through and a real hankering for red meat. Stopped at this REALLY swish place, and had the best beef tenderloin. It came with complementary soup and salad, and the salad is spun and dressed in front of your very eyes! They wheel a trolley out to your table! So cool. Tomorrow I'm doing a killer flight. Singapore-Jakarta, then Jakarta-Singapore, then Singapore-Colombo. The only reason we get two days in SIN and CMB is because the flight is THAT bad. The passengers yesterday were really nice though so it gives me something to look forward to. Plus a grotty hotel in Sri Lanka. Nice.